Our Cuillin Ridge ‘Skye from the Sea’ ring features a snapshot of the Cuillin mountain range. 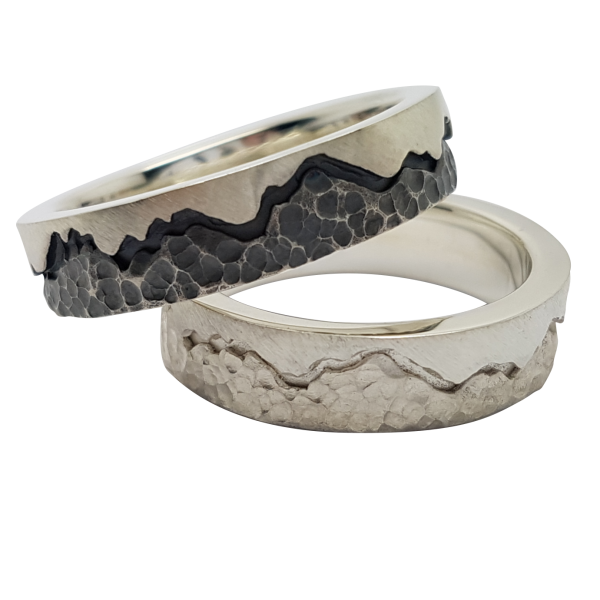 The mountain design is continuous all the way around this chunky ring and the band measures 6mm in width. (This width is considered to be the standard option of this design). This design is made exclusively by Love from Skye on the Isle of Skye. 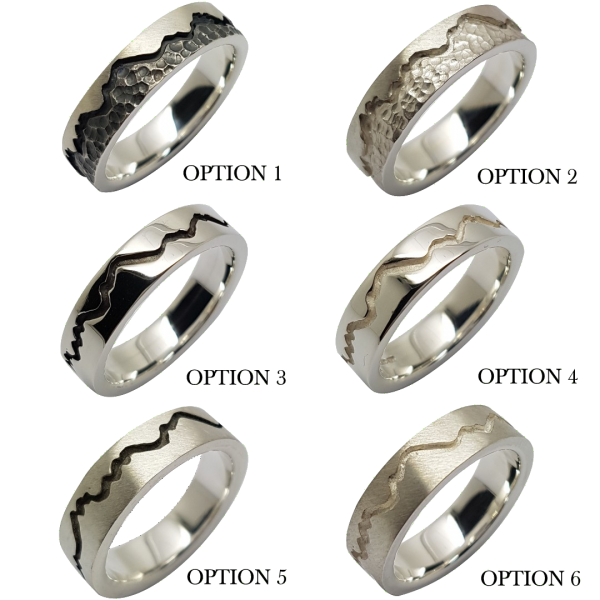 Option 1 is intended to be worn as an occasional or dress ring rather than for everyday wear due to the surface effect on the mountains. This finish will change over time and with wear. The timeframe for this happening will vary from wearer to wearer but can happen relatively quickly. Option 2 is a textured / hammered effect which can rub smooth with excessive wear but is a more practical option for everyday wear. Options 3 – 6 are the most suitable finishes for regular wear. Options 3 and 4 are polished while options 5 and 6 are finished with a matte effect. The ridge between the sky and the mountains are oxidised to darken the silver in options 3 and 5, while the silver in the ridge is left in a raw state for options 4 and 6. Care guidance will be included with your purchase, however, if you wish to find out more information before placing your order, please contact us. 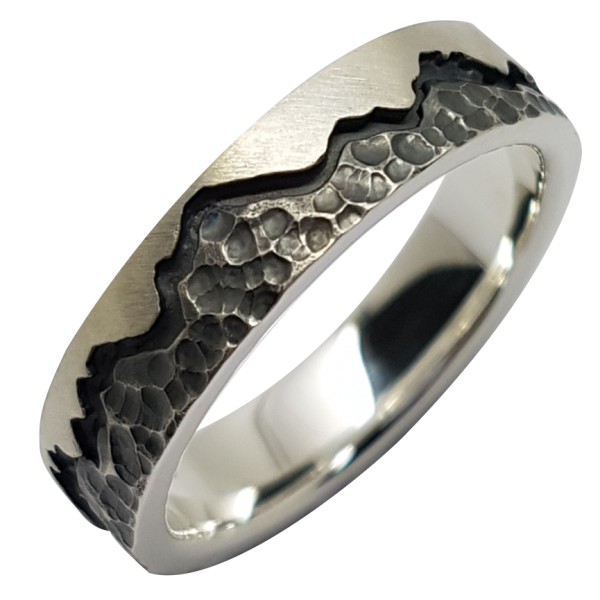 Please also let us know if you are considering this design as a wedding band. Please note that this design can take 3 – 6 weeks to be made to order and that we make only a small number of this design for display in our shop. We also make this design to order in gold and in combinations of silver and gold. Please contact us for further information if you require this design in a size which is unavailable to select above. All our rings are available in any size you require, however, sizes larger than those possible to select above will be subject to a small additional cost to cover the additional materials required. For more information on selecting the correct ring size, please see our Ring Options and Sizing page. Please click here to download an information document with further information about this design, including more images and frequently asked questions. We ordered this ring for our wedding next January. It came the day it was said to arrive and it fits perfectly. My fiance is very happy with his ring and we are excited to have him wear it after the ceremony so he’s always reminded of home.